Driver Matt Rheinheimer scored the biggest day on the 15-race program at the Shelby County Fairgrounds Monday, July 30. The racing program was originally scheduled for Fayette County Fairgrounds in Connersville, but the card was moved to Shelbyville. Matt Rheinheimer returns to the winner’s circle with his third winner on the day Monday, July 30, scoring a win with Byron Hooley’s Summit City Swan. Under a cloudy, cool, and rainy morning, Rheinheimer’s first win of the day was recorded with Vortex Ivy from his barn. The two-year-old filly pacer moved in the final quarter to open up by two and one-quarter lengths for the win over Play To The Crowd and Charlie Conrad, who also used a closing move. Rockinattheryman and Don Eash finished third. The Jereme’s Jet filly stopped the timer in 2:05.0. Rheinheimer’s second win of the afternoon was recorded with another horse from his barn as Dojea Rock scored his first career win by a neck in 2:05.2 over J-S Allnitelong and Alex Udell. Owned by Dojea Stables of Wolcottville, Ind., Dojea Rock dug in gamely in the stretch to overtake J-S Allnitelong at the wire by a neck for the win. Letsmakithapncapn and Eash finished third. 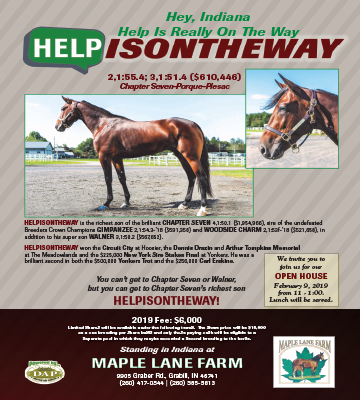 Rheinheimer was back in the winner’s circle in the first division of the two-year-old filly trot behind the Byron Hooley trained Summit City Swan. Rheinheimer placed the Swan For All filly in behind Starlit Tuffy and Austin Hanners before moving out around the final turn and taking control of the race, winning by one and one-half lengths in 2:07.1. Starlit Tuffy finished second over Neon Norma and Robert Taylor for third. 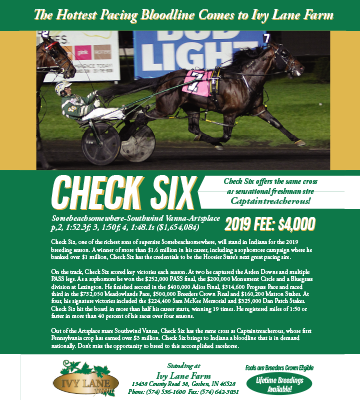 Chuckiessweetdream and Lester Raber fend off J-S Swanman and Alex Udell for the win in a division of the two-year-old colt and gelding trot. Other multiple winners on the day included the hot team of Alex Udell and Jack Myers, who scored the quickest two-year-old filly pace division with J-S Perfect Cache in 2:01.2. They also scored a win with two-year-old trotting colt J-S Power Chip in 2:07.0. 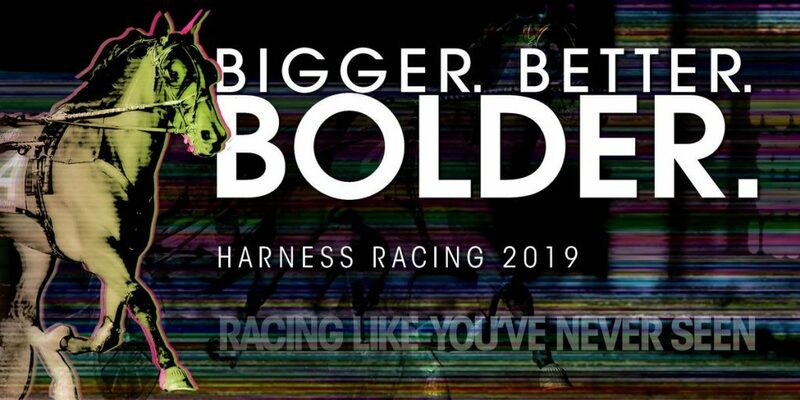 Jordan Ross and Robert Taylor connected for a driving and training double with two-year-old trotting fillies Julianna’s Jet in 2:09.0 and Whykatiewhy in 2:10.2. 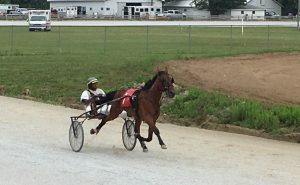 Zach Miller also scored a double on the day with Mity Tino in a division of the two-year-old colt and gelding pace in 2:03.3 and Serene Hall in a division of the two-year-old colt and gelding trot in 2:08.3. Mity Tino is trained by Zach while Serene Hall is trained by his father, Alvin Miller. One of the most impressive races of the day was the mile turned in by Chuckiessweetdream and Lester Raber. The Pilgrims Chuckie colt set the fractions of the race with J-S Swanman and Udell right at his heels. In the stretch, J-S Swanman tipped out for the stretch drive home and got by Chuckiessweetdream for a few steps before the colt battled back for the win by a head over J-S Swanman in 2:03.3 with a final panel in 30 seconds flat. Sunburst Guccihoni and Marcus Hill roll home to an impressive win in the third division of the two-year-old filly trot. 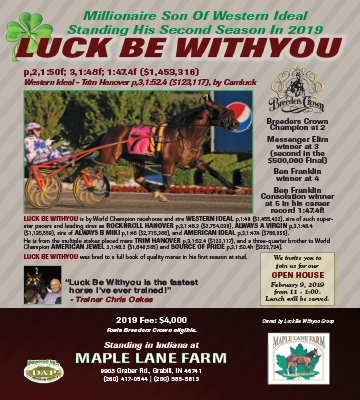 Even though the murphy blind fell down on Chuckiessweetdream during the mile, it was a drop of nearly seven seconds off his previous lifetime best for Raber, who co-owns the horse with Floyd Raber of Odon, Ind. and serves as the colt’s trainer. 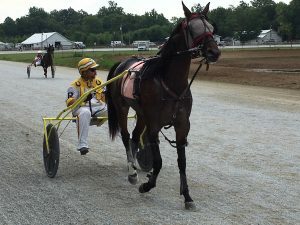 Another impressive winner on the day was two-year-old trotting filly Sunburst Guccihoni, who scored her first win. Owned, trained and driven by Marcus Hill of Madison, Miss., the Guccio daughter scored a gate to wire win in her third career start, stopping the timer in 2:07.0 five and one-quarter lengths ahead of Platinum Big Stick and Mike Hollenback. 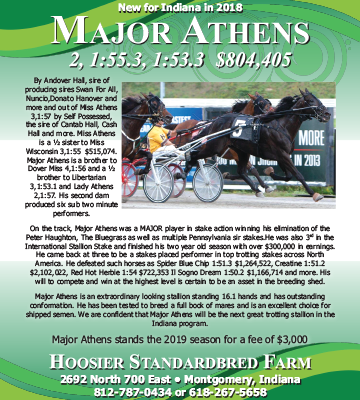 Three-year-olds will be in action Tuesday, July 31 at Shelbyville. Eight races are slated on the card that begins at 11 a.m.